The case presentation will be a little different than our typical failure to diagnose an aortic disaster or other common “failure to diagnose” entity in emergency medicine. 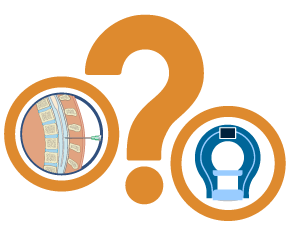 Although those are great teaching cases, there is another critically important side to the patient safety coin. It is critical to do the appropriate testing to identify potentially fatal presentations, but it is equally important to understand when such testing is inappropriate − testing that itself may by unnecessary and may actually cause morbidity. When is testing appropriate and when is it unnecessary? If there is strong evidence in the literature that creates a validated and widely accepted diagnostic algorithm, the practitioner has strong guidance. But what is the correct approach when national guideline-setting bodies suggest one approach and the literature begins to suggest another? Let’s use an actual case example to demonstrate; just a quick warning − this is some seriously cutting-edge stuff! We present a first-of-its-kind “should we do a lumbar puncture” analysis. A 35 y.o. woman presented to the emergency department with a severe headache. She had a history of headaches, but this headache came on over a relatively short period of time and began 3 hours prior to arrival. She had no significant past medical history. She had no significant risk predisposition to subarachnoid hemorrhage. 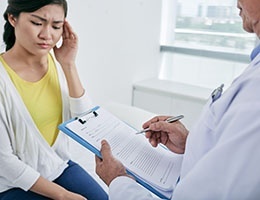 Based upon the onset and severity of the presentation and the patient’s response that this was the worst headache of her life, the practitioner was considering subarachnoid in the differential diagnosis. The physician appropriately ordered a CT scan, which was completely normal. The scan occurred approximately 3.5 hours after the onset of the headache. What is the next step? New-generation CT scans are quite sensitive, particularly in the first 6 hours after headache onset. But sensitivity is not 100%; this patient may still have a subarachnoid bleed undetected by the scan. If a bleed was still possible, should the practitioner proceed with a lumbar puncture, often called the “gold standard” for ruling out a subarachnoid? Let’s first consider any national guidelines from authoritative organizations that may give us direction. The last guidance from the American College of Emergency Physicians (ACEP) was in 2008 (1). That guidance essentially indicates that if the practitioner is still considering a subarachnoid post-CT, then a lumbar puncture is required. The American Stroke Association (ASA) issued a guidance in 2012 with essentially that same recommendation (2). So if you follow that national guidance, our 35 y.o. is about to get a lumbar puncture. In fact, that is what happened. The practitioner performed a lumbar puncture, which was negative, and ruled out a subarachnoid hemorrhage. Unfortunately, there was a complication. The patient developed a spinal fluid leak and had excruciating head pain for over two months. She was completely debilitated for two months as a result of a known complication of lumbar punctures and needed a follow-up procedure to patch the leak. That begs the question: Did she need an LP in the first place? This is not a benign procedure. Is the national guidance outdated? The answer is yes, it is outdated. The problem is that although there are many studies focused directly on the research question of whether an LP is necessary following a negative CT, the evidence is not yet strong enough to change the national guidelines and recommendations. In recent national lectures I have attended on the subject, I have heard a number of speakers and authorities provide a clinical recipe, if you will, for avoiding LP. 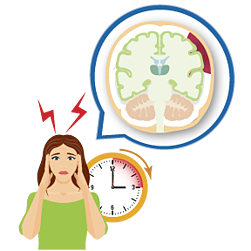 For example, “If the CT is negative within two hours of headache onset, no LP is required.” Another is, “If it is a thunderclap headache and the CT is negative within six hours and there is no neurologic deficit or stiff neck, no LP is required.” Although these recommendations may have resulted from good research, to date there is no “CT only” or “CT plus clinical finding” rule that clearly establishes next steps in the CT negative patient. The evidence has not yet arrived. Talk about a rock and a hard place! So you decide not to LP based upon what you heard at a recent conference that convinced you, based upon some constellation of the patient’s presentation, that a CT alone or a CT-LP clinical rule is adequate to defer LP − when in fact a subarachnoid bleed was present. If a lawsuit follows, the plaintiff’s attorney can make a very strong case of “failure to diagnose”/”failure to LP” based upon the current ACEP and ASA national guidance. And the jury will NOT understand the current state of the relevant literature. So this is the exciting part! What is the right answer? The correct answer is that while we remain in limbo without strong, clear, research-backed guidance, use Bayesian logic to determine how many patients you would need to LP in order to find one case of subarachnoid hemorrhage. That is, determine the pre-test probability for obtaining a positive LP, and then turn that into a number that the practitioner and patient can understand. Armed with that data, the practitioner and patient can engage in shared decision-making. If the equation tells you that 75 LPs are necessary to get one positive, you may well recommend it. If it is 1 in 750 LPs, I think most practitioners and patients would defer. 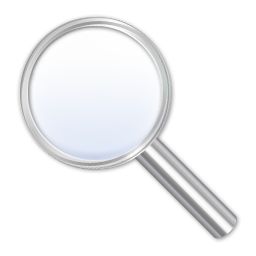 Carefully document a discussion that a practitioner, a patient and potentially a jury would understand. The most significant publication on the matter is “Spontaneous Subarachnoid Hemorrhage: A Systematic Review and Meta-Analysis Describing the Diagnostic Accuracy of History, Physical Exam, Imaging, and Lumbar Puncture with an Exploration of Test Thresholds” by Carpenter et al. (3) This article is a great resource in that they visited all relevant research on the subject of LP or no LP that was available to date. I worked with one of the authors to help me translate very complicated statistics into a formula that I and my emergency physician colleagues could understand. He created a “Decision Analytic Model for Spontaneous SAH.” It takes every piece of clinical data that impacts the LP/no LP decision in a statistically significant manner − not to get stuck in the weeds here − and incorporates them into a “number needed to LP” to get a positive test. This number is incredibly useful. Example #1: Let’s make this a VERY typical emergency physician conundrum. A 40-year-old male presents with a headache. He states it was sudden in onset and the worst headache of his life. The practitioner orders a CT, which is completed within 6 hours of onset; it is negative. Given this presentation, I would guesstimate that many practitioners would move right on to a lumbar puncture without further decision support. 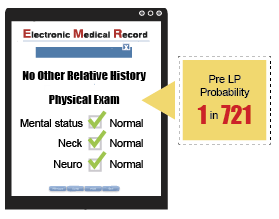 However, consider this: if there is no other relevant history and the physical exam is normal − specifically mental status, neck and neuro exam − this patient has a pre-LP probability of 1 in 721. With that presentation, based upon the best research on the planet, you would need to do 721 LPs to get a positive test. That is a little surprising, isn’t it? And isn’t that great information to have to discuss with the patient? With this information, the practitioner and patient can make a truly informed decision about whether to proceed. Both will probably feel like it is okay to defer. Those are great odds. Example #2: Take the exact same case, but now I will add the fact that there was an abnormal mental status initially on physical exam. That pre-LP probability is 1 in 288. Now let’s add to the formula that the patient complained of neck stiffness. That pre-LP probability is 1 in 52. 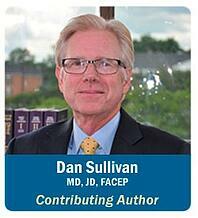 I’ll take that LP, and I think most practitioners would recommend it and most patients would agree to it. Now that is decision support and medical decision-making! This would be a very welcome tool for many practitioners who face this decision on a daily basis. The key here is building this decision-making seamlessly inside the electronic medical record; then when you reach the MDM section of your chart, this algorithm is already populated with the CT result and the relevant history and physical exam data points. When you get to MDM, you simply take the number of LPs required and head for the patient for some shared decision-making. 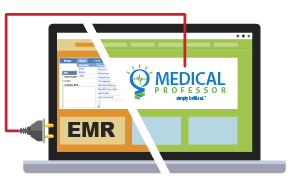 It is worth mentioning that our recent developments with a new physician documentation system called Medical Professor™ helped provide the focus for this TSG Newsletter article; that and the fact that this LP complication actually involved a friend of mine. Fortunately, this is an application that can simply “plug into” other existing Enterprise EHR systems like Epic and Cerner. If you are interested in seeing how we are building EBM algorithms and auto-creating MDM notes with advanced cognitive decision support into Medical Professor™, please contact Brant Roth at broth@thesullivangroup.com. Moreover, if you have identified other challenging areas of medicine that new EBM algorithms can use to facilitate medical decision-making or shared decision-making, please contact info@medicalprofessor.net. Christopher, RC, et al; Spontaneous Subarachnoid Hemorrhage: A Systematic Review and Meta-Analysis Describing the Diagnostic Accuracy of History, Physical Exam, Imaging, and Lumbar Puncture with an Exploration of Test Thresholds. Acad Emerg Med. 2016 Sep; 23(9): 963-1003.